With the freezing cold winter in Europe, I believed most Europeans want to go for vacation to a place where the weather is warm and friendly. This is the best time of the year to go for a holiday somewhere in the tropics. Some of you might still be thinking which is the best place to escape the cold winter in Europe. Thailand in Southeast Asia for example can be one of your choices. Be sure to find the best and the cheapest Thailand holiday packages online or in your travel agency nearby. Here are some of the things you might want to see and experience when visiting the so-called "Land of Smiles". 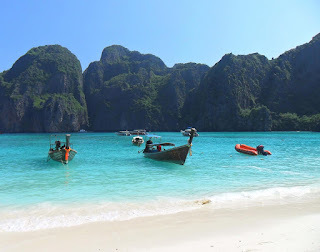 Beaches and Islands- I believed this is one of the main reasons why Thailand attracts millions of visitors from around the planet every year. It is very famous for its white sand beautiful beaches especially in Pattaya, Ko Samui and Phuket. Phuket, Thailand. thanks to my friend Cathy for this image. Historical and Cultural Attractions- Thailand is one of the countries in Southeast Asia which is rich in both cultural and historical attractions. Bangkok, its capital city is often the starting point of visit of most tourists from around the world. The Grand Palace which is home to Wat Phra Kaew, the most sacred Buddhist temple in Thailand that houses the Emerald Buddha is a must- see when visiting Bangkok. If you have interest in Thai history, Ayutthaya and Sukhothai are the best place to visit. Interesting sights like Si Satchanalai and Kamphaeng Phet are also worth of stops. These sights are included in the list of UNESCO World Heritage Sites. Shopping- This is one thing you should not miss when visiting Thailand especially in Bangkok. There are a lot of markets and malls in this city which sells cheap goods like clothing, handicrafts, electronics and a lot more. Grab a Thai silk as a souvenir. If you have the chance, go visit the night bazaar in Chiang Mai. Outdoor Activities- One of the best experience when visiting Thailand is snorkeling or scuba diving. I remember a friend named Cathy who told me that these outdoor activities are such a great adventure under water. Rock-climbing in the limestone cliffs of Rai Leh are said to be among the best in the world. Longboarding and sea-canoeing are also among the good things to experience in this country. Pamper Yourself with Thai massage and Spa- Once you visit Thailand, why not try a relaxing experience and pamper yourself with Thai massage. It is said that this massage has a history of over 2,500 years. Many Thais believe that these massages are beneficial for curing diseases and for general well-being. Thailand is also one of the highest ranking spa destinations in the world. Swedish massage, aromatherapy and other form of massages are also offered in many spas and hotels in Thailand. Depending on your budget, you can have an extravagant wellness in the five star hotels or to the ubiquitous little massage shops found on many street corners.